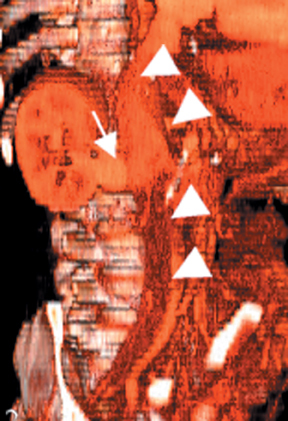 Computed tomography (CT) demonstrated a focal enhancing ovoid density adjacent to the right renal hilum continuous with the right renal vein. It had an enhancement pattern similar to that of the right renal vein. A frequent incidental finding, renal varices can be idiopathic or associated with either renal vein thrombosis, obstruction, or congenital anomalies of inferior vena cava, as well as azygous or portal hypertension.1,2 Idiopathic renal varices demonstrate left predominance, with an incidence of 6% to 10% in renal donors on phlebography.1,3 The etiology of left predominance in idiopathic cases has been postulated to be stretching of the renal vein over the aorta and compression between the superior mesenteric artery (SMA) and the aorta, known as the nutcracker phenomenon.1,4 In addition, extensive collaterals from other organs and weakness of the vein wall may be contributing factors.1 Furthermore, the absence of gonadal vein valves and abnormal collaterals between the renal and gonadal veins have been suggested as contributing factors.2 In 31% of renal vein varix there is associated saphenous vein varicosity. 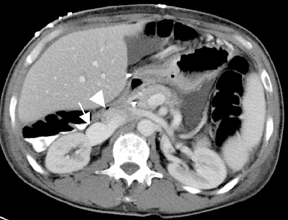 Renal vein varices are a frequent incidental finding on CT or MRI. Renal varices may mimic renal masses especially on noncontrast CT scans. The continuity with renal vein and similarity to vein appearance on all imaging modalities are important differentiating factors. Complications are rare, and include hematuria, obstruction, and stone formation. Surgical ligation or embolization may be used to treat varices associated with pain or hematuria. Beckmann CF, Abrams HL. Idiopathic renal vein varices: Incidence and significance. Radiology. 1982;143(3):649-652. Weiner SN, Bernstein RG, Morehouse H, Golden RA. Hematuria secondary to left peripelvic and gonadal vein varices. Urology. 1983; 22(1):81-84. Rendak I, Pison C, Drouin G. Demonstration of renal varices using technetium-99m red blood cells in the investigation of recurrent macroscopic hematuria. Clin Nucl Med. 1987;12(11):861-863. Trambert JJ, Rabin AM, Weiss KL, Tein AB. Pericaliceal varices due to the nutcracker phenomenon. AJR Am J Roentgenol. 1990;154(2):305-306. Deibler AR, Nadig SN, Curry N, Bissada NK, Hull GW. Intrarenal varix presenting as an enhancing renal mass with calcifications. J Urol. 2001;166(3):997-998. Curry NS, Frangos DN, Stanley JH. Thrombosed right renal vein varix simulating a renal pelvic mass. Urol Radiol. 1987;9(1):36-38. Hohenfellner M, Steinbach F, Schultz-Lampel D, et al. The nutcracker syndrome: New aspects of pathophysiology, diagnosis and treatment. J Urol. 1991;146(3):685-688. Nielsen PT, Nielsen SM. Idiopathic renal vein varicosities. Presentation of two cases and a brief review of the literature. Scand J Urol Nephrol. 1984;18(1):91-95. Right renal vein varix. Appl Radiol.